At Charter we want to develop the students in our care holistically and give them the skills to be independent, lifelong learners with their own individual passions and enthusiasms. One of the big focuses this year has been on on Social Responsibility. Each Homeroom group has adopted its own good cause and done something to help them. ​Amongst the many activities this year, I think the Year 9 project stood out for me. They decided they wanted to help the children of the Mercy Centre. However, rather than just donate money they wanted to give the children there something more memorable. They decided to put on a football tournament for them. However, as they soon discovered, this costs money. How to raise the money? They struck on the idea of having a video games day in school. 'That’ll be simple to organise and raise loads', they thought. Once they got into it, they soon discovered, the amount of organisation that goes into making something like that happen is huge. Of all the things the Year 9s learnt this year these will be the ones that stick with them the longest and help them the most in their lives. They worked as a team, they took individual responsibility, they negotiated with adults, they planned ahead. The amount of learning that came out of this was amazing. All of it lead by the students. 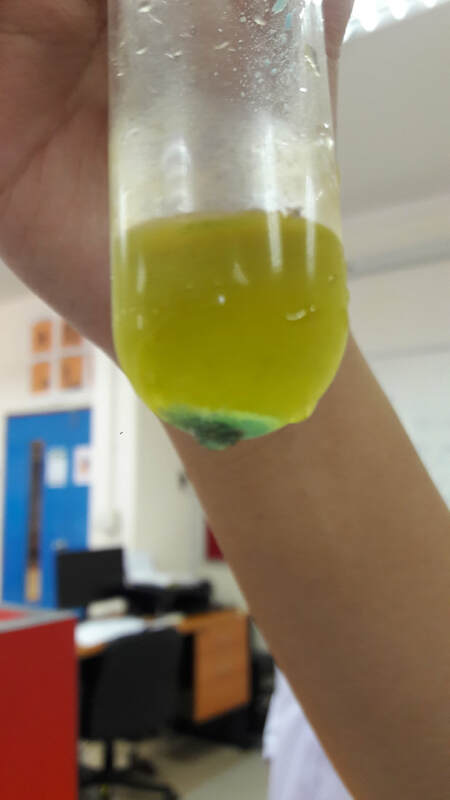 Teachers pointed out where they were going wrong to ensure it was a success but, crucially, it was the students who had to solve the problems. ​Other year groups have gone out into the community and worked with disabled children in their schools. The empathy that this engenders in our students is amazing. They have been out in the sun painting buildings that provide food and shelter for those who need it. Seeing the problems people face first hand is far more powerful than just raising money to help. It makes our students understand why they need to help by putting faces and personalities to the problems. Crucially, it also shows them that by doing just a little they can make a huge difference. It is too easy when watching the news to say ‘This is a huge problem. What can little me do?’ The answer is, as it has always been, something! If we want our students to grow up with the soft skills that employers say they want then we have to give them the chance to develop them. If we want them to grow up to be empathetic people who are determined to have a positive impact on their communities then we have to show them that they can do that too. This week we have the next stage in the renewal of our CIS and WASC accreditations. At this point that means we have two visitors in school for a week who will look at absolutely everything we do. They will have meetings with a range of teachers on a huge range of topics. They will ask us about our curriculum and how we ensure high standards in that. Well, of course they do, we’re a school and that’s what we do. However, they will also ask about admissions and how we make sure there is a good fit between the school and our students, the safety of the students is a prime concern, they will also look at how we recruit people, the finances, what the board does; in fact everything that we do. They will not only speak to teachers and TAs, but a group of parents, the Board, and students… After all, they are the ones who know! All being well, the next stage of accreditation is an 18 month self-study. We, as a school community will look in depth and in detail at everything we do. We will use the report generated this week as the basis for our study. It is simply not possible to reach perfection in a school. Things can always be better! By taking the time to look critically at everything we can find those little things that could be done better. In the hurly-burly of a school it is too easy to do things purely because ‘that is how we do them’ without thinking how could they be done better? This desire to continuously be better and better, to improve the learning journeys that our students are on, is the driving force behind all schools who seek CIS and, in our case, WASC accreditation. The other side of the coin is that there is an incredible amount of excellence going on in the school and it is really important that we recognise and celebrate that. Tthis gives us a chance to prove what we all know to be true: That we are a really good school. All of those students who are working hard, the teachers that plan exciting lessons that develop curiosity, creativity and critical thinking and then deliver those lessons with passion and empathy. The teacher that gives up their lunchtime so that two excited students can look at a topic in more depth. The extra time and support given to a student that is still developing their English skills, the basketball tournament on a Saturday, the trips that are safe and well organised. The admin and maintenance staff that make sure it runs smoothly and safely. All of these things that allow all the students to succeed and, most importantly, develop their passions, opinions and individual identity. The standards set for this are the standards that we set for ourselves. We are judged against what it is we say we do. If you have been into a classroom, you cannot help but see the posters with the School’s learner Outcomes on in each room. These are the personification of the goals we have set ourselves and it is against those standards we will be judged. One of our School outcomes is for students to be socially responsible. Therefore, one of the key things we will be asked about this week is that: How do ensure our students are respectful of different cultures? How do we measure our success in doing that? (Always a tricky one to answer!) How could we do it even better? Finally, in around 18 months time, we will have a team of teachers from a variety of international schools stay with us for a week and go through our report and the school with a fine tooth comb to make sure we have an accurate impression of ourselves. They will produce a report outlining and commending all the myriad things we do well and suggestions for what we need to do to be even better yet. This report will then form the basis for school development over the next 18 months to 2 years… Just about in time for us to start the whole process again. It’s not called continuous improvement for nothing. If we want to be better and give our students the best opportunities and experiences possible then we need to be honest with ourselves and not sit back on our laurels and admire the things we are good at. We need to say ‘that’s good but how can it be absolutely world class?’ How can we push the boundaries on this area? And that is why we bother with CIS and WASC accreditation? As well as studying the traditional humanities subjects of History and Geography in Years 7-9 our students also study Global Perspectives (GP). The aims of GP are twofold. Firstly, as the name suggests, we want our students to develop a knowledge of and interest in the world around them. This means more than just watching the news. We expect them to look at the deep underlying causes of problems and then come up with solutions. This is, of course, no easy task. However, it is only by studying something in detail that students avoid superficial and simplistic responses. This in depth approach gives students an appreciation of the difficulty in solving problems and, often inspires them to start doing something of their own to help. Secondly, Global Perspectives provides an excellent opportunity for students to work together in groups, or to hone their presentation skills or to think creatively about the finished product that they produce, for example. The assessment criteria that students are judged against will usually carry an element of these as well as grading the actual content of the work. These skills that GP specifically encourages and develops are the ones that employers and universities tell us again and again that they most value. It is this understanding of global problems along with the creativity and critical thinking skills that make an international education such an excellent foundation for their future lives, this is particularly important when one understands that so many of our students have ambitions to be leaders in government, NGOs or business. I would add one other aspect to the list of traits that GP nurtures and that is the idea that each of us has both the duty and the ability to make a change and if we don’t no one will! 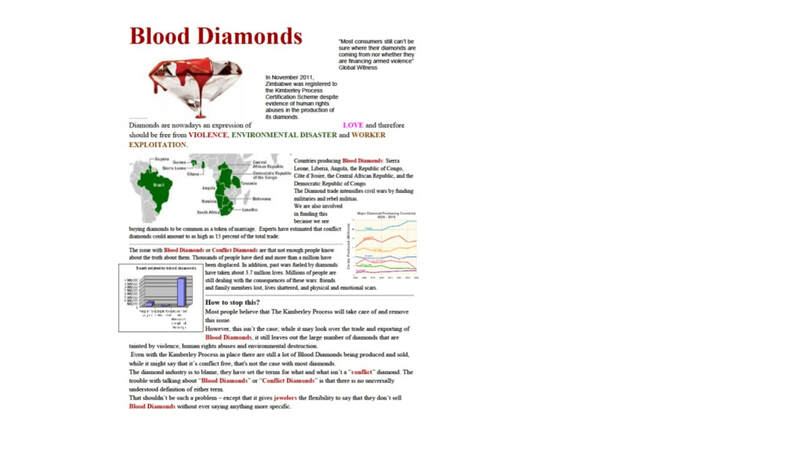 Below you will find a poster and a video explaining two of year 9's thinking on the complex and sensitive subject of blood diamonds. Or, we could mention T.S. Eliot in his poem The Wasteland “Do I dare Disturb the universe?” Go on, dare to! 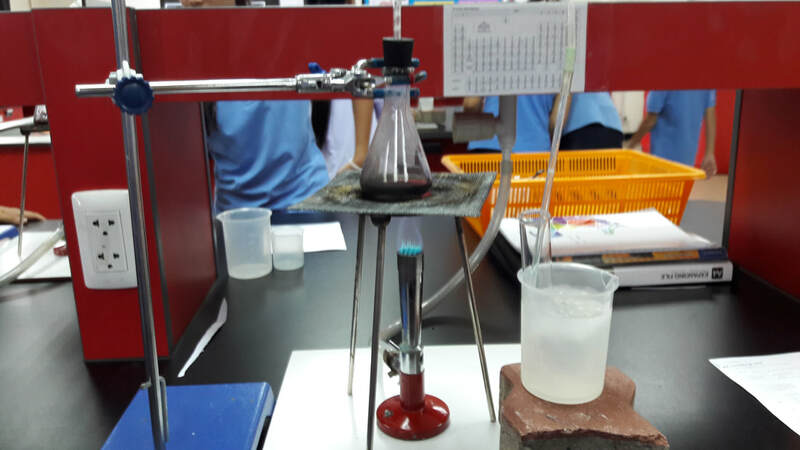 Students set up equipment to distil cola - they got pure water after separating the CO2 and cola. 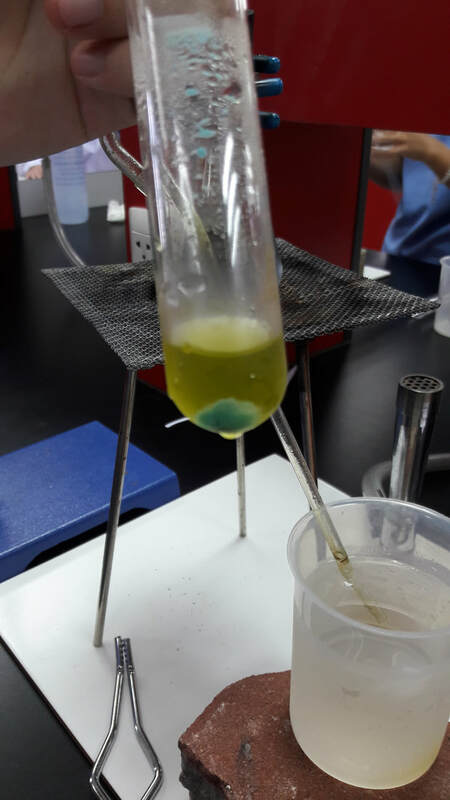 They then tested this with anhydrous copper sulphate which turns turquoise with water. New lessons, new friends and new teachers, of course. We have a new Secondary library. It is a fantastic looking addition to our campus. This is the latest addition to our campus as our growing numbers mean we have outgrown the old library and that has reverted back to being a place dedicated to the Primary School. Why have we called it a Study Centre and not a library? When I say 'library' it is a fair bet that images of old dusty rooms full of books that nobody has looked at in living memory flared up in your mind's eye. That is not what this space is for. It is, first of all, a study room for our most senior students. It is a light and airy space for them to get grips with their A Level work, with room to spread out and feel comfortable. However, it is also a space for the rest of the secondary school to use. Lessons will be held in here, for example on research techniques. Believe it or not, there is more to research than a Google or Ecosia search! Having said that we are a 1:1 laptop school and this room reflects that. Most students get their information from online sources now rather than books. They work much more collaboratively than when we were (I was!) at school and this space allows them to do that. 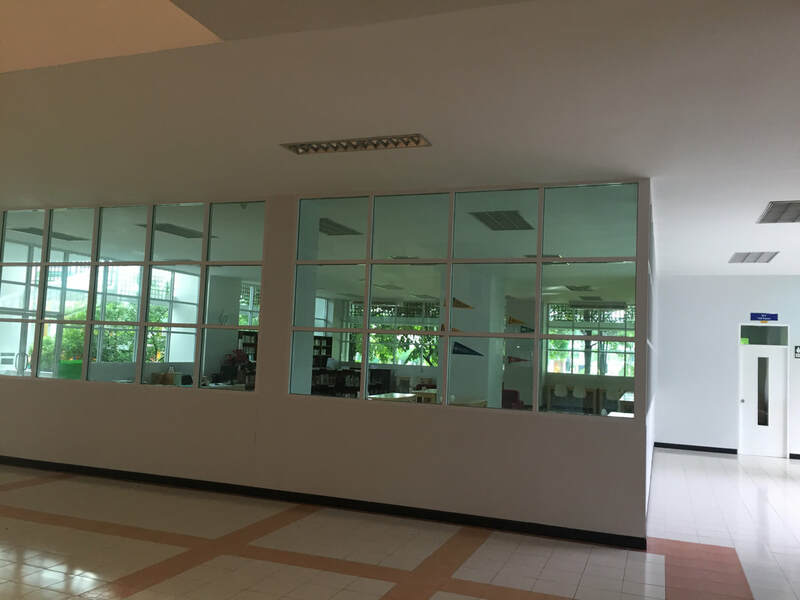 I think you will agree that it looks both really modern and, at the same time, that it has been a part of the school since the day it opened. ​Students in Year 9 have been working on a robotics project for 6 weeks. Over the course of these 6 weeks, students have investigated ways to control the robot and programmed it to respond to different conditions. Part of this project involved students being creative using a green screen. This video from Ping Ping, Jin, Lisa and Nai demonstrate their creativeness and ability to program as a group. Our Year 10 Computer Science students are encouraged to record their learning as blog or website. This will then become their primary resource for revision when it comes to exam time. The quality of work they have produces is, simply, stunning! They have not only showcased their talents but also helped their exam chances too. It will be much easier to revise using their own website. Work of this quality sends a powerful message to their sub-conscious that this work looks amazing because it is important. Time was invested in it because it is important. Students producing work that they value and others outside of school read is a real motivator for them. Both of the screen shots below are links to their respective websites. Click on them and take a closer look at the amazing computer science Charter students are producing. Last week saw the first IGCSE exams of this summer's series. As always, the first exam was Art. 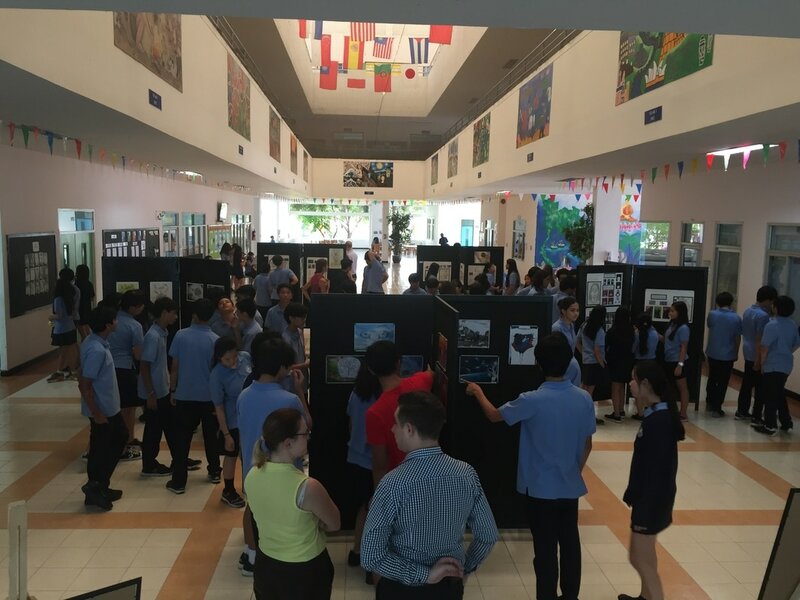 The Year 11 Art students spent two days putting into practice all of their ideas and preparation that they had been working on for the last few weeks. The exam is only part of their final grade. They also submit a portfolio of work for submission. This year's topic, set by the exam board was 'similarities and differences'. The students are then free to interpret that title as they want. 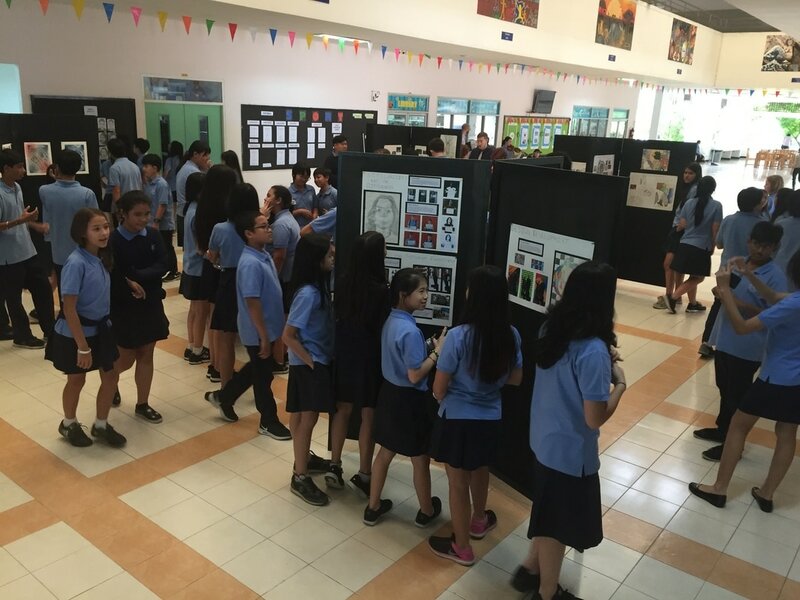 The annual Art show is an opportunity to showcase not only this work but the hard work that goes on in the Art department day in, day out. Every Art student in the Secondary school had work on display in some form or another. There was a real sense of anticipation and pride in the air as students hunted for their work and admired that of other year groups. However, in many of the international schools I have worked in many students and their parents fear that if they focus on 'soft' subjects like Art it will damage their chances of getting into a good university or college. I firmly believe nothing could be further from the truth. 'A surge in demand for multimedia artists, animators, and illustrators—especially those who are computer – and technology-savvy—is projected for 2018, due to companies’ demand for advertising in online and digital formats.' Said the US's National Endowment for the Arts. Things are definitely ​changing and 'creative' and 'art' students are faring better and better in the modern world. While Art continues to be a desirable option for students wishing to pursue ‘traditional’ creative careers, such as Architecture, Interior Design or Painting / Fine Art related professions, the internet has seen an explosion of exciting, new roles emerge. Obviously, if you want to be a doctor, Biology, Chemistry and Maths are the important subjects universities will be looking for. That doesn't mean that studying Art is not going to be of benefit to you. For example, unless otherwise stated, no one subject is looked on more favourably than others for admission to UK universities. 1. An explosion in demand for digital and multi-media artisits. Many of us are connected to the internet for long periods of time, whether it is looking for information, socialising, playing games, shopping, watching videos or anything else for that matter. The demand for web designers, app designers, software designers, graphic designers, digital illustrators, multimedia artists, video producers, online publishers, animation artists, game designers and many other digital careers is undergoing unprecedented growth. These are all well-paid, creative jobs that require lots of skill to do well. 2. The internet has made it easier to make a living as a fine-artist. It is now possible, via your own website, to make and sell your own Art to an audience located anywhere in the world. I am not saying that this is an easy career path but it certainly exists. This is possible for students still at school if they have the drive, creativity and talent. 3. Those with a wide skill set will have an advantage in the jobs market. As I said above, some jobs and university courses require a clear set of skills or qualifications. Most do not! Showing that you are creative will be an advantage in tomorrow's job market. 4. Art improves performance in other areas. Art enhances fine motor skills, hand-eye coordination, problem solving skills, lateral thinking, complex analysis and critical thinking skills. No matter what career you choose, those who can arrange, present and display material in a way that is aesthetically pleasing have an advantage. 5. Good marks impress! It doesn't really matter what the subject a string of good grades is going to impress more than mediocre ones in other subjects. 6 Art is not all about an exam. Some students do not do well in exams. They just do not show their true potential under that kind of pressure. Art tends to have more of a coursework focus that might well allow those students to achieve very well. Typically, Art is the first exam of a session, and a week or two earlier than others. This also reduces the pressure when the rest of the exams come around. 7. Coursework teaches self-discipline. The need to be organised and making progress a long time before a deadline is not an easy thing. Art helps to teach this. It is near-impossible to rush so a methodical work pace over a length of time is a must: A most useful skill. 8. Art makes people happy! Possibly the most important reason. There is something magical about creating. It does 'feed the soul'. It makes students look at things anew, even boring, mundane things have a beauty if you are looking for it. For many it is a release from stress and a way of relaxing. All of which, on their own, are excellent reasons for taking art. Remember, it is not only doctors and engineers who lead successful and happy lives! 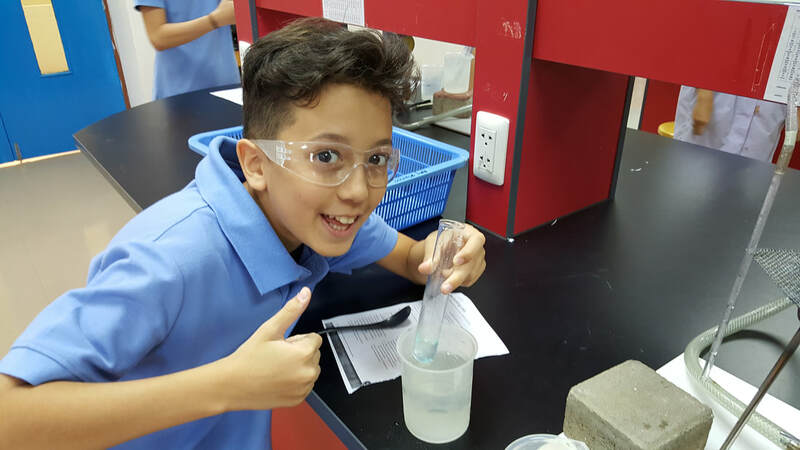 The aim of this is to give you more than just a flavour of what is happening in different aspects of Secondary section life at Charter International School. We will go into more detail about what is going on in different subjects and all those cross curricula events that make the school such a great place to work and learn. Students will have a voice and explain what they have learnt, how they have learnt it and why they think it was useful or fun or interesting. Hopefully, this will give an idea as to what life is like in the school on a day-to-day basis, what we think a good school should aspire to be and the never ending journey to becoming that school. We want to build an engaged community so your comments are welcome but will be moderated before appearing!